Timeless yet new; classic yet modern; black yet white. 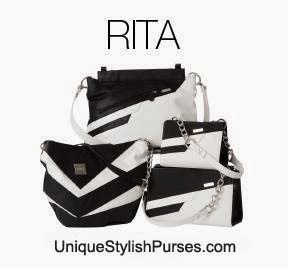 Opposites definitely attract in the design of Rita Miche bags. Inky-black faux leather with angled geometric accents in snowy white is complemented by contrasting stitching. These Shells are a breath of fresh air that’s sure to bring you compliments.